Home Politics Opposition Wonky. Specific. Bread-and-butter Centered. Straightforward. Wonky. Specific. Bread-and-butter Centered. Straightforward. 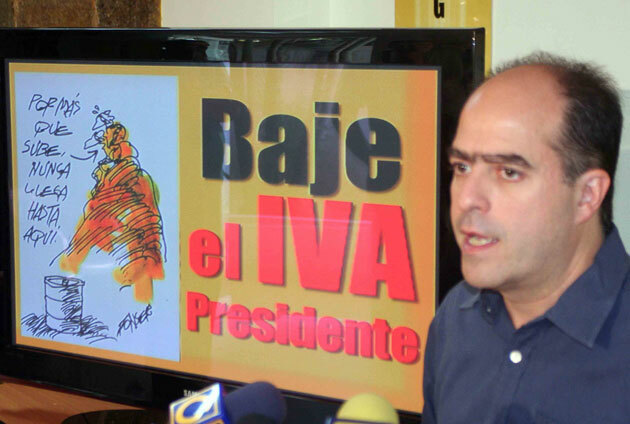 I think Julio Borges’s attacks on Chávez’s foreign largesse are getting more and more effective: with the $13.5 billion Venezuela sends abroad in various subsidized oil schemes to bolster Chávez’s political allies, you could afford to get rid of Value Added Tax altogether. In other words, you pay IVA so Lukashenko can repress Belorussians better. Obviously, a line like that is only likely resonate people who think the gov’t-vs.-opposition question is about who can run the country better, not with the people who see it as a matter of meta-cosmic struggle between transcendent good and ontological evil. But then, the shouting match with the loonie squad is a giant distraction in the first place, no? Now that’s pushing the policy-making envelope!